This week turned out to be good for running. I increased my mileage as planned, ran my 16 mile long run (yay! ), and had a fun Halloween. California International Marathon is getting very close, and although I haven't ramped up as much as usual I think it'll be ok. I've trained so hard in the past and still had two pretty bad marathons for random reasons, so who knows? I've been entertaining thoughts of not running CIM at all - I don't want the long recovery period and set back on my half marathon times that has happened after my last two marathons - but I'll probably end up running it. This was my weekend to detox after running three half marathons in a row, and I did. 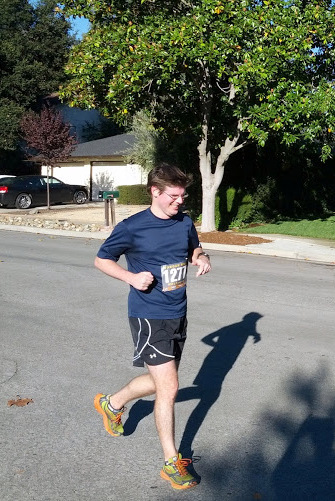 I volunteered at the Morgan Hill Marathon in the morning, ran a couple of miles along the course there to cheer, and then ran 3.5 when I got back to San Jose in the afternoon. It was a relaxing day. I was a course marshall for the marathon at about mile 2.5, so I spent a while cheering on runners and making sure they turned left. 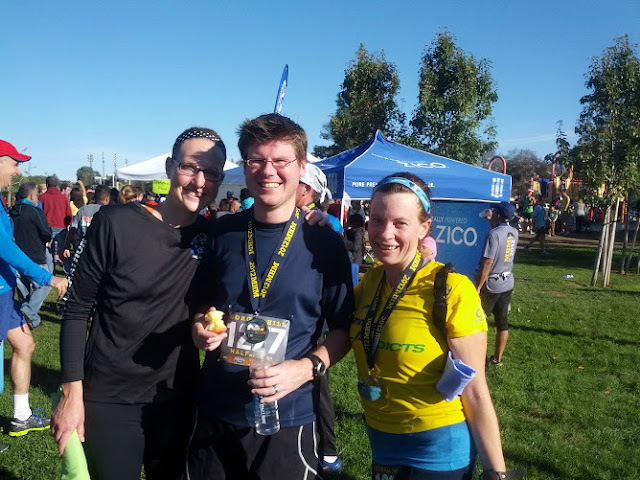 After that, I cheered for the half marathon finish around mile 12 and met up with friends at the finish. Kevin ran the half at Morgan Hill, although he didn't have the best day and ended up with a sore foot from landing funny downhill. Overall a really nice event. 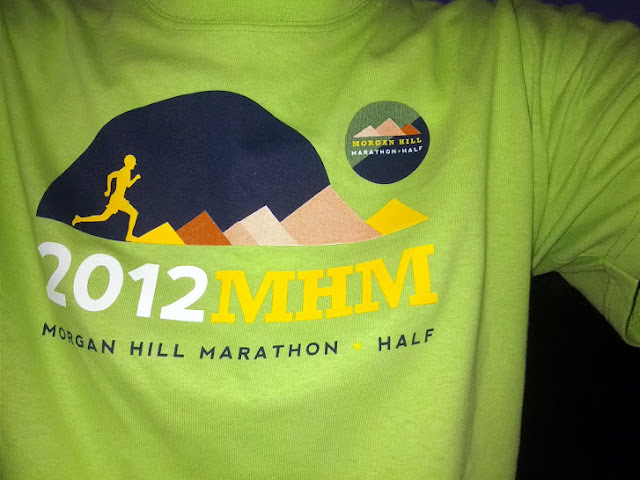 Morgan Hill Race Crew shirt, love the bright green. Us with friend Alisyn at the finish. This turned into a rest day, although I'd planned to go to a track workout. My allergies aren't super happy right now, and I had one of the worst headaches I can remember on Monday so I went to sleep. I began going to a barre class at lunch and I'm loving it. I absolutely feel it, but for some reason it doesn't feel mentally hard even when I'm getting a good workout. This is turning out to be great for added strength training and toning. I did my speed workout in the form of hill repeats because I missed the Monday track workout. I ran 3.3 miles with a friend to warm up, 6x hill repeats with downhill recovery (uphill paces 8:02, 7:28, 8:17, 8:15, 8:27, 7:45), and about a mile cool down. I was very happy with this workout and felt exhausted after, which I consider a win. 6 miles at easy pace to follow my hill repeat day. I felt good, weather was cool and breezy; this was one of those awesome I-could-go-on-forever days. Also on Wednesday, I volunteered for the ZoomRunning Halloween half marathon and 5 mile. Most people run this in costume and it was so much fun to see everyone dressed up. I dressed up too, and after the race went out for beer with a couple of friends. More on these Halloween adventures here. In hindsight, I wish I would have run this race too but I didn't want to back out of volunteering! This was a trail run morning with friends, a highlight of the week. We ran the hills at St. Joseph's Open Space Preserve in Los Gatos, which is a normal meeting spot for us. I love this trail but the uphill definitely gets you! It's getting close to CIM, and this was my longest run so far. As you may have read in my post about me and marathons, I decided to take this training cycle lighter based on wanting to do more half marathons in the fall and not enjoying the marathon distance right now. I'll be ramping up to 18 instead of 20 this time; we'll see how it goes. I know tons of people that do this or even less, but in the past I've gone the other direction and run potentially too many 20 milers. The 16 mile run went ok and I was below my planned marathon pace, so that's good. Kevin came with me but we left too late in the morning; we were out on a very exposed path in the heat of the sun for a long time. My side cramp came back again, although it wasn't as bad as it has been and I focused on breathing correctly to keep at bay. On the bright side, the city paved a significant portion of Guadalupe River Trail that used to be rocks and dirt, and it's fabulous for running now! They have even more of it grated and prepped to pave, so the trail is getting better and better for long runs. Good news for us. Hey Paulette ..congrats on the half marathon PR ..
re CIM..I have a soft spot for that course..my first sub 4.. I love the rolling (mostly down) hills followed by the dead flat last 6 miles. And hopefully nice and cold for you that day! Finding the right mix of training for the marathon is different for each person and I think it's a good idea to experiment. I'm definitely hoping for cold! :) Thanks Paul. I feel like I'm teetering on the edge of too many 20 milers. I think experimenting is a great idea. My last long run before CIM is this weekend, so I'm right with you on the hesitation. There's no best way for everyone to train for a marathon so just trust yourself and see what happens. Please run CIM, it would be cool to meet up! I look forward to hearing how the no 20 works out for ya. I only did one for the Columbus cycle and then 22 miles but that was over a relay, so I am curious how even further breakdown works. Ideally I'd do one 20, I'll just end up one long run short with timing. We'll see! My husband actually likes to train to 18 anyway. Glad you guys had a great week Paulette!